Who will be the top performer in the WBBL final? Alyssa Healy, Grace Harris, Ellyse Perry or Dane van Niekerk? 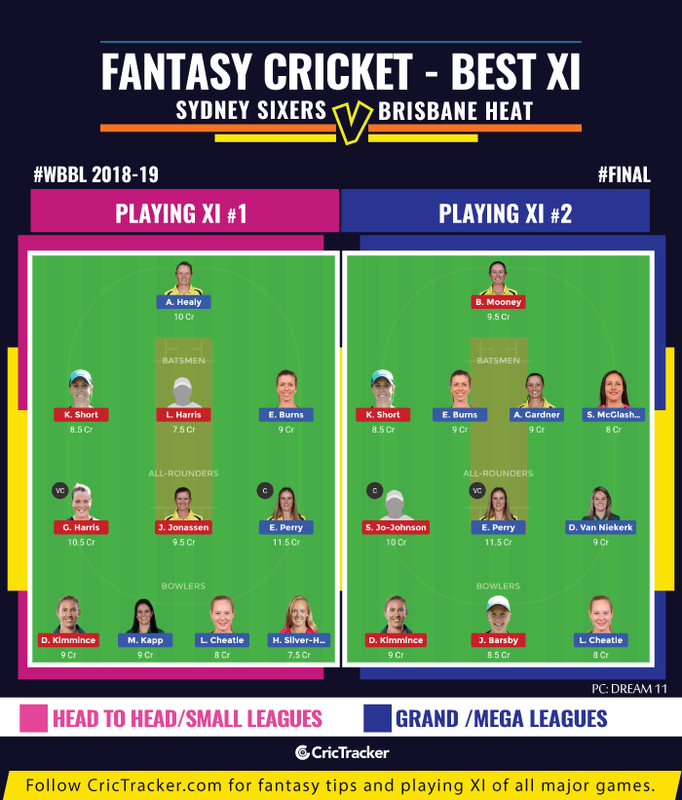 Sydney Sixers will be featuring in the Women’s Big Bash League final for the 4th consecutive time and will be aiming for the 3rd title in a row when they face Brisbane Heat in Drummoyne Oval. On the other hand, Brisbane has made it to the final for the first time in the WBBL. Both the teams had to fight hard to earn narrow victories in the semi-finals during the last week. Sydney Thunder needed five runs to win from the last ball in the semis against Brisbane. A sensational effort at the boundary stopped Thunder’s further progress and the game going into final. The other semis between Sixers and Melbourne Renegades went into the Super Over. Two brilliant fielding efforts from the Sixers stopped Renegades from cruising into the final as they needed 3 runs from the last ball but picked up only a couple. Sixers made it to the final by chasing down the target of seven in the Super Over in only four deliveries. The Final match of the Women’s Big Bash League (WBBL) will be played between Sydney Sixers and Melbourne Renegades at the Drummoyne Oval in Sydney. The match starts at 10:10 AM local time (11:10 PM GMT – Prev Day) (4:40 AM IST). The game will be live on Sony ESPN and Sony ESPN HD in India. Live streaming is available on Sony LIV. The Drummoyne Oval produced two thrilling games during the last weekend for the semi-finals. The pitch slowed down as the day progressed which might not be seen during this final. Score over 150 can be expected with the chasing team having an edge due to one of the short square boundaries. Ellyse Perry (C), Alyssa Healy (WK), Ashleigh Gardner, Erin Burns, Sara McGlashan, Dane Van Niekerk, Marizanne Kapp, Lauren Smith, Sarah Aley, Hayley Silver-Holmes, Lauren Cheatle. Grace Harris, Beth Mooney (WK), Sammy-Jo Johnson, Jess Jonassen, Kirby Short (C), Josie Dooley, Laura Harris, Laura Wolvaardt, Delissa Kimmince, Jemma Barsby, Haidee Birkett/Sune Luus. No Changes made to their squad. Dane van Niekerk has been a silent performer for the Sydney Sixers this season having picked 17 wickets from 15 matches. She has picked up at least one wicket in 13 of the 15 matches. Niekerk went wicketless in the previous game but already had covered it up with a match-turning half-century. Both the multipliers can be picked from the all-rounders’ category for this game. Ellyse Perry, Grace Harris and Sammy Jo-Johnson are suitable as captain while Jess Jonassen and Dane van Niekerk are vice-captain material. Alyssa Healy, Erin Burns and Kimmince are perfect as captain or vice-captain outside the above mentioned five. Bowlers – Delissa Kimmince, Jemma Barsby, Lauren Cheatle. As many as five top all-rounders from this season are part of the all-rounders’ category for this game. Ellyse Perry will be an obvious choice while Niekerk can be picked as she not only ensures a consistent performance but also increases the credits for other players. Grace Harris is the best among the three Brisbane players while Sammy-Jo batting at three makes her as valuable as Perry. The Sydney Sixers are expected to make a hat-trick of WBBL titles but not without a tough fight from the Brisbane Heat. 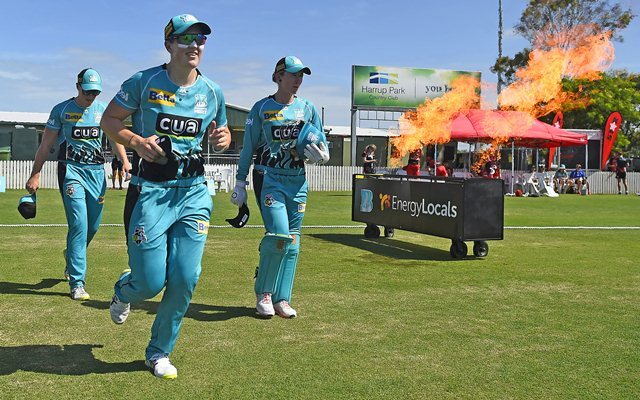 Get the latest Cricket News and updates from Women’s Big Bash League, Match Predictions, Fantasy Cricket Tips and lots more on CricTracker.com.